Tired of the conventional process of ordering pizza online? 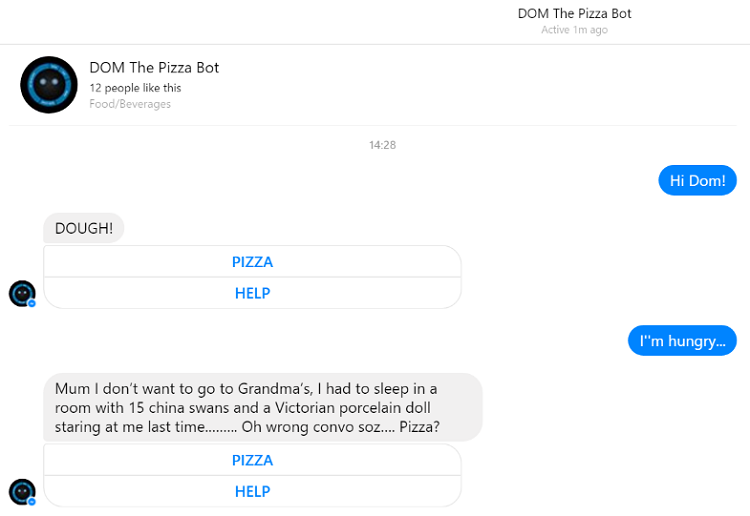 The pizza bot from Domino’s for Facebook Messenger is here to spice things up for you. This clever little creature feature goes by the name of Dom, and will not only take your order over chat, but will also entertain you with some cheesy pizza puns too. Chat bots have been making their mark in the past few months, with brands finding new and innovative ways to drive sales directly through the Messenger app. With Facebook Messenger hitting 1 billion users, it opens fantastic opportunities for brands to experiment with this technology. Domino’s is one of the first to multiply on the opportunity, making the most of our time poor and attention span starved generation. You’ll need to sign up to an Easy Order system and save your address details alongside a “favourite basket”, though and that means you’ll have the same pizza each time you order via the bot. But when you’re obsessed with Pepperoni Passion who is really complaining?